The ancient Copper Culture of Isle Royale built a Dolmen and left behind a pair of recumbent Rocks. Mr. Bruns of Duluth identified both sites as man-made. The Little Bear Dolmen tells the story of the Egyptian discovery of America during the Old Kingdom. America was discovered via the Bering Sea in the Fourth Dynasty. All the Atlantic Crossings were discovered in the Fifth Dynasty. – The Two Rocks tell the story of the Dardanus Flood, which was caused by a worldwide Comet Catastrophe at which 6 million people died (32%). It happened during the reign of the 2nd king Ramses III of the 20th Dynasty. It lasted 40 + 40 = 80 days. The precipitation was c.5.5 meters of water. It ended all ancient civilizations on Earth, including the New Kingdom. However, the monument also tells the story of the metal trade until this Disaster: 384,000 tons of copper from Upper Michigan, 38,400 tons of tin, 18 tons of silver, and 38 tons of gold from Bolivia, and 10 tons of gold from Brazil were shipped to the Old World. The Arrowhead Region is located in the extreme northeastern part of Minnesota, just north of Lake Superior. In this remote area are some important lithic remains left behind by the ancient Copper Culture of Upper Michigan. In prehistoric times copper was mined on a large scale at Keweenaw Peninsula and on Isle Royale. The sailing distance from this island to the peninsula of Grand Portage, MN, close to the Canadian border, is only 13 km. The Dolmen is located on the eastern bank of the River, at 48°N (and 91°W), at a distance of c.40 km from the shore of Lake Superior. It consists of a large boulder, placed on three little stones (Fig.2). The boulder has an oval shape with a flat top. It has a length of c.2 m, a width of c.1.5 m, and a height of c.1 m. Two stones at the base have the same size, but the third one is about twice as big. Their diameters are about 10 and 20 cm, respectively. The last mentioned stone is placed in the south. A dolmen is a kind of monument of the Megalithic Culture, which flourished in Western Europe from 5500 to 1000 BC. However, megalithic structures are known all over the World, and also of later date, until the birth of Christ. A dolmen may be considered as a small house of God, a pre-christian church or chapel. It is probable, that the later Egyptian civilization started as a result of this Culture, because in ancient Egypt the king or pharaoh was the substitute of the SunGod Ra. Little Bear Dolmen consists of 3 + 1 = 4 stones. So, it appears something important happened during the Fourth Dynasty of Egypt. The four stones also refer to the 40th latitude line south of the Arrowhead Region. In the Old World latitudes were already used 4800 BC. This line runs from coast to coast, all across the continent of North America. It appears America was discovered in the Fourth Dynasty. The southern Aleutian islands, at the south side of the Bering Sea, are located at the complementary latitude of 90o - 40o = 50oN. In antiquity the use of complementary latitudes was very common. The large boulder (the fourth stone) is the symbol of North America, because this continent was discovered in the Fourth Dynasty. However, it is also the symbol of the North Atlantic Ocean, because its size was already known during this Dynasty. The Southern Crossing starts at the Cape Verde Islands, offshore West Africa, at 16oN (see above). The Nile Delta of Egypt, at 30oN, provides its sailing direction of 30o SSW. The 50th latitude line, just mentioned, illustrates the point of arrival at Cape São Roque (the Holy Rock), Brazil, at 5oS. It shows this Crossing, with the wind and the current, was discovered in the Fifth Dynasty. Its length of c.2 Moiras, or 20o, encodes the 2nd king Sahure (c.2510-2498 BC) as the discoverer of the Southern Crossing. King Sahure had to return with his sailing ships to the Old World. The boulder encodes the start of the Return Route at the East Cape of North America, which is Cape Race, Newfoundland, 1o below the site, at 48o - 1o = 47oN. The initial sailing direction is 20o ESE. It confirms the Route was discovered by the 2nd king Sahure. He sailed, with the wind and the current, over 2 Moiras, or 20o, to the two islands of the West Azores, in the middle of the Ocean. The Azores were already discovered c.3600 BC. So, the 2nd king Sahure discovered the two southern crossings of the Ocean. Note, that the two small stones of equal size refer to this 2nd king (Fig.2). The Northern Crossing of the Ocean runs via three land points: the Shetland Islands, Cape Farvel, Greenland, and Cape Chidley, Canada. These are located at the complementary latitude of the Nile Delta, at 90o - 30o = 60oN. The Nile Delta itself is located at 30oN. So, the 3rd king Nefererkare (c.2498-2478 BC) of the Fifth Dynasty discovered the Northern Crossing. It was the third discovered Crossing of the Ocean. Greenland was already discovered c.3200 BC. Note, that the third little stone of double size refers to this 3rd king. The Dolmen indicates there were not three, but four Crossings of the Atlantic. The last discovered Crossing starts at Abaco Island, Northern Bahama’s, 4° above the Tropic of Cancer, at 23o + 4o = 27oN. The Return Route runs via the island of Bermuda, 5o above it, at 27o + 5o = 32oN. It shows the Route was discovered in the Fifth Dynasty. The 2nd king Sahure (c.2510-2498 BC) reigned for 12 years, so the sailing distance to Bermuda, 2° above the Nile Delta, at 30o + 2o = 32oN, equals 12 moiras, or 12o. The Return Route runs via Bermuda to the nine islands of the Azores. It indicates the latitude of Bermuda, 9o above the Tropic of Cancer, at 23o + 9o = 32oN. The island was discovered by the 9th and last king Unas (c.2403-2370 BC) of the Fifth Dynasty. The sailing distance from Bermuda to the three island groups of the Azores (East, Central and West Azores) equals 3 Moiras, or 30o. 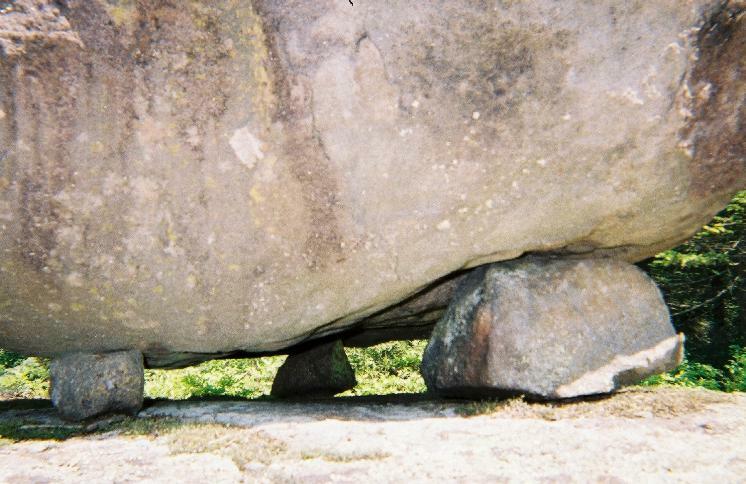 Little Bear Dolmen consists of four stones, and the fourth stone is a big boulder. These refer twice to the Strait of Gibraltar, the entry of the Mediterranean Sea, 4o below the 40th latitude line, at 40o - 4o = 36oN. It shows people circumnavigated the planet Earth, having a circumference of 36 Moiras, or 360o. The Dolmen is located at 48oN. This latitude is 48o - 36o = 12o above Gibraltar, encoding the Twelfth Dynasty of Egypt. The site in the Arrowhead Region is located 12 Moiras, or 120o west of the Nile Delta, when measured along the equator. This confirms the site dates from the Twelfth Dynasty. The last crossing to the New World was discovered at the 60th latitude line from the Shetland Islands to Cape Chidley, Canada. The Dolmen is located 60o - 48o = 12o below this line, confirming this Dynasty, again. Little Bear Dolmen is located 48o - 30o = 18o above the Mississippi Delta, at 30oN. It refers to the south point of the Gulf of Campeche, Mexico. It is the center of the Land of Punt, the Realm of the Dead in the west, at 18oN. The latitude corresponds to half the circumference of the planet Earth, 18 Moiras, or 180o. It is the location of the start of the Olmec civilization. Both Delta’s of the Nile and Mississippi Rivers are located 30o - 18o = 12o above the south point of the Gulf of Campeche, confirming the date of this Dolmen in the Twelfth Dynasty. 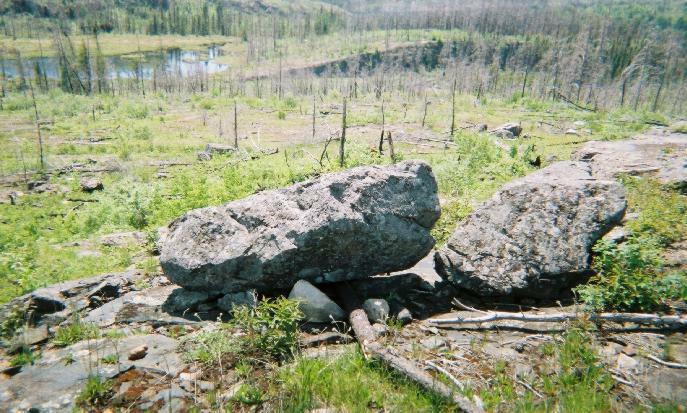 A Pair of Rocks (Fig.3) is located in the Arrowhead Region in northeast Minnesota, close to the Canadian border. At the western end of Gunflint Lake, a bit north, is Magnetic Lake. The Rocks are situated on a cliff, just west of it, near Pogo Lake, c.60 km NW of the town of Grand Marais on Lake Superior. 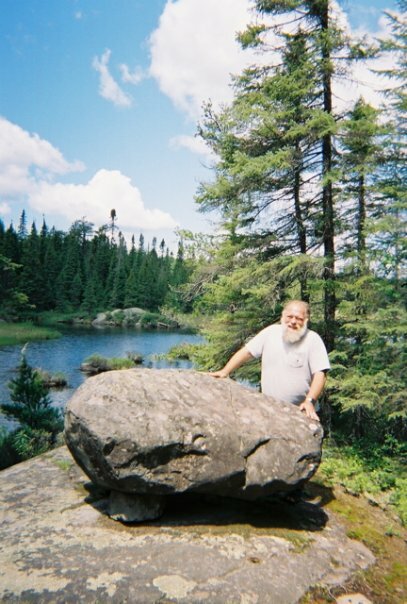 The site is not far from Magnetic Rock (Laurentian Menhir).46 The Rocks were discovered by Mr. Charles Bruns of Duluth, MN. In 2011 he identified the site as definitely man-made. The Magnetic Rock in the neighborhood told the story of the Biblical Flood, which was caused by a Comet Catastrophe at the start of the Sixth Dynasty (c.2344 BC).46 It appears, that the Two Rocks at this site tell the story of the Dardanus Flood in the 20th Dynasty (c.1159 BC). It was the second, big Disaster in the history of Egypt, as indicated by the Two Recumbent Stones. Both have a length/width ratio of three (3), which suggests the site deals with the third period of good government in Egypt, which is the New Kingdom. The periodicity of the Comet equals 575 years. So, the Comet was expected to return in the year of 2344 - 2x575 = 1194 BC. It was the first year of government of queen Tausert (1194 - 1186 BC), who acted as a regent for king Siptah (1194 - 1188 BC), the last Heads of State of the 19th Dynasty. However, the Comet exploded near the Sun. A dangerous part of it reached the Earth 35 years later, in 1194 - 35 = 1159 BC (tree ring dating). The meridian, or north-south line, of the site crosses the Mississippi River at 34°N, almost confirming it. The same meridian leaves Boothia Peninsula at 70°N. Each of the Two Rocks now confirm these 70/2 = 35 years. The Two Rocks indicate the Comet Catastrophe was a two stage event, just like the Biblical Flood. The Delta’s of the Nile and Mississippi Rivers are located at 30°N. These correspond to the 30 days of the month. So, the duration of the Disaster is expressed in days. The 40th latitude line is the most famous one of North America, because it encodes the Egyptian discovery of the continent in the Fourth Dynasty. However, it also encodes the first time period of 40 days of the Dardanus Flood. The falling stones were causing horrible forest-fires, and the melting ice resulted in torrential rains and worldwide floodings. It was completely dark on Earth. The second time period lasted 40 days, too. The climate was completely disrupted. The terrible rains continued, but it also became very cold. So, the rains changed into ferrocious snow and hail storms. The Two Rocks are located 8° above the 40th latitude line, at 48oN. It confirms each of the time periods of 80/2 = 40 days. It also confirms the total duration of the Dardanus Flood: 80 days. The north cape of Panama is located at 10oN. The complementary latitude at 90o - 10o = 80oN confirms it, too. In antiquity the Head of a Comet was symbolized by the island of Greenland, consisting of ice and stones. The Tail of a Comet was symbolized by the North Atlantic Ocean below it, which contains a huge amount of water. The Azores in the middle of the Ocean are located 38o - 30o = 8o above the Nile Delta, confirming the total duration of 40 + 40 = 80 days. The Central Azores consist of 5 islands, encoding the precipitation during the Dardanus Flood, 50 micromoiras = 50x0.11 = c.5.5 meters of water. The latitude line of the site hits the east coast of Lake Superior 5o to the east, confirming it. It even crosses the Ocean between the East Cape of Newfoundland (and North America) and the West Cape of Brittany, France over 50°, confirming it, too. The Two Rocks refer to the important latitude line above the site, at 48o + 2o = 50oN, confirming it, again. The consequences of this Comet Catastrophe lasted to the end of Dynasty 22, about four centuries after the event, as shown by the 40th latitude line. The climate on Earth was much colder and dryer. The site is located 8o above it, at 48oN. The Two Rocks confirm these 8/2 = 4 centuries. The Strait of Gibraltar is located 4o below the 40th latitude line, at 40o - 4o = 36oN, confirming it, too. It corresponds to the circumference of the planet Earth, 36 Moiras, or 360o. It shows it was a worldwide Catastrophe. It ended all ancient civilizations on Earth, including the New Kingdom! The Azores in the middle of the Ocean are located at 38oN, encoding the 3.8 million casualties of the Flood. The meridian of the site hits the coast of the Gulf of Campeche at 20oN, encoding the 2.0 million casualties because of system collapse (lack of government, wars). The same meridian leaves the south coast of Hudson Bay at Cape Tatnam, at 57oN, almost corresponding to the total number of victims. However, the island of Bermuda is located at 32oN. The north coast of Scotland, at the complementary latitude of 90o - 32o = 58oN, confirms the correct number: 3.8 + 2.0 = 5.8 million men. The meridian of the site leaves Boothia Peninsula at 70oN, in agreement with the 7 figures of this number. Cape Farvel, the south cape of Greenland, is located at 60oN, confirming the total number of casualties, c.6 million men. The length of its meridian on the Northern Hemisphere equals 180o, encoding the original world population before the Catastrophe, 18 million men. The “complementary latitude” of 180o - 60o = 120o corresponds to the number of survivors, 18 - 6 = 12 million men. The Azores are located 38o - 30o = 8o above the Nile Delta, confirming the 8 figures of this number. Cape Cod is located at the complementary latitude of the site, at 90o - 48o = 42oN. The difference in latitude is 48o - 42o = 6o, encoding the 6 million casualties of the Dardanus Flood. The meridian hits the south coast of Lake Superior at 47oN, which is 7° above the 40th latitude line. It corresponds to the 7 figures of this number. The site is located 48o - 30o = 18o above the Mississippi Delta, encoding the world population before the Dardanus Flood: 18 million men. It is located 8° above the 40th latitude line, corresponding to the 8 figures of this number. The south point of the Gulf of Campeche is 30o - 18o = 12o below the Delta, confirming the number of survivors, 18 - 6 = 12 million men. Most of them were seriously wounded. The south point of the Gulf of Campeche is located at 18oN, confirming the original world population before the Flood, 18 million men. It is the center of the Realm of the Dead (the land of Punt), where the Olmec Culture started. Cape Gallinas, the north cape of South America is located at 12oN, corresponding to the number of survivors, 12 million men. The difference equals the number of casualties of the Dardanus Flood, 18 - 12 = c.6 million men. – Note, that the length/width ratio of the Two Rocks together equals six (3 + 3 = 6), confirming the 6 million victims. The length/width ratio of each of the boulders equals three (3), twice encoding the date of the monument: 3 dynasties after the 20th Dynasty of the Dardanus Flood. So, the monument of the Two Rocks was made in Dynasty 23 (c.818-715 BC). This Dynasty was very active in erecting sacred sites, because its number encoded the holy Tropic of Cancer, at 23°N. Far in the east it crosses the River Nile. It was the center of the Southern Egyptian Empire, but also the center of the Sun religion. It appears, the Two Rocks tell not one, but two important stories. The second story deals with the inter-continental Metal Trade. The monument is located 2o west of Isle Royale, which can be considered as the center of copper mining in North America. The 50th latitude line is 2o above it, at 48o + 2o = 50oN. It runs along the northern shore of the Gulf of Saint Lawrence. The ancient capital of Cahokia at the confluence of the Mississippi and the Missouri (and the Illinois River) is located 48o - 39o = 9o due south of the site, at 39oN. The two islands of the West Azores in the middle of the Ocean are located at the same latitude. These 9o correspond to the density of copper, 9 g/cm3 (nine times heavier than water). The meridian of the site runs to the Mississippi Delta, at 30°N. It shows, that 3/5, or 60%, of the copper was shipped along the Mississippi River to the south. The West Azores are located 9o higher, at 30o + 9o = 39oN, confirming the density of copper. The mouth of the Saint Lawrence River is located 20o higher, at 30o + 20o = 50oN. It shows, that the remaining 2/5, or 40%, of the copper was transported to the east. The monument is located 48o - 40o = 8o above the important 40th latitude line, which shows that tens of millions of copper ingots were shipped to the Old World (a number of 8 figures). The Two Rocks are located at 48oN, encoding an overall export of copper of 48/2 = 24 million copper ingots. Bermuda is located 32o - 24o = 8o above the Strait of Florida, at 24oN, confirming it. The island is located 40o - 32o = 8o below the 40th latitude line, confirming the 8 figures of the number (24 million). Cape Race, Newfoundland is located 47o - 39o = 8o above the West Azores, confirming it. The Central Azores are located 38o - 30o = 8o above the Nile Delta, confirming it, again. For a long time past the noble metals were weighed in units of carats, corresponding with 0.20 gram. The carat is the constant mass of a seed of the St. John’s bread or carob tree (Ceratonia siliqua). The site is located 48o - 40o = 8o above the 40th latitude line. The Two Rocks encode the complementary latitude line at 48o + 2o = 90o - 40o = 50oN. So, the Standard Ingot will have a mass of 80,000 carats (a number of five figures), or 80x0.20 = 16 kg. In the Old World bronze was made by alloying the copper with 10% tin. (The words ‘tin’ and ‘ten’ are even related.) The 40th latitude line is located 10o above the Mississippi Delta, at 30o N, confirming it. The north cape of Panama is located at 10oN, confirming it, too. Tin was a very scarce metal. Although generally unknown, a lot of it was imported from South America. The Two Rocks and Isle Royale are located 18o above the Mississippi Delta, at 30o+18o = 48oN. It also refers to the tin mines near the present town of Oruro, Bolivia, at 18oS. The tin was transported (as ingots) along the coast to the north, and from the Pacific to the Atlantic. The site is located 48o - 39o = 9o above Cahokia, encoding the isthmus of Panama, at 9oN, as well as the nine islands of the Azores. In the Bronze Age the overall export of tin from the mentioned site was 10% of the copper, or 2.4 million tin ingots (a number of 7 figures). The meridian hits the south coast of Lake Superior at 47oN, which is 7o above the 40th latitude line. It corresponds to the 7 figures of this number. The North Coast of Honduras is located 16o - 9o = 7o above the Isthmus of Panama, confirming it. Bermuda is located 32o - 25o = 7o above the south cape of Florida, confirming it, too. It also corresponds with the density of tin, 7 g/cm3 (seven times heavier than water). The quantity corresponds with c.38,400 tons of tin. Silver was found together with tin. The 40th latitude line is located 10° above the Mississippi Delta, at 30oN, encoding the density of silver, 10 g/cm3 (ten times heavier than water). The north cape of Panama is located at 10oN, confirming it. The site is located 48o - 39o = 9o above Cahokia, encoding the isthmus of Panama, at 9oN, as well as the nine islands of the Azores. It also encodes an overall export of 90 million carats (a number of eight figures), or 90x0.20 = 18 tons of silver. Most of the silver in the Old World was imported from Bolivia, in South America. The Two Rocks and Isle Royale are located 18o above the Mississippi Delta, at 30o + 18o = 48oN. It also refers to the silver mines near the present town of Oruro, Bolivia, at 18oS. The Two Rocks confirm the site is located 18o/2 = 9o above Cahokia. It confirms the overall export of 90 million carats of silver. Gold was traded at the mouth of the River Amazone. The Two Rocks encode the important latitude of 2oS. They also refer to the latitude line above the site, at 48o + 2o = 50oN. It encodes an overall export from this area of 50 million carats (a number of eight figures), or 50x0.20 = 10 tons of gold. However, the Two Rocks indicate gold was obtained from two different places. Gold was, besides tin and silver, also obtained from the far more important mining area just east of Lake of Poopó, near the present town of Potosi, Bolivia, at 19oS. It is indicated by the density of gold, 19 g/cm3 (nineteen times heavier than water). It even encodes the overall export of gold from Bolivia, 190 million carats (a number of 9 figures), or 190x0.2= 38 tons of gold. The Isthmus of Panama, at 9oN, confirms the 9 figures of this number, as well as the nine islands of the Azores. The Two Rocks are located at 48oN. They confirm the overall export from America to the Old World, 50 + 190 = 480/2 = 240 million carats, or 240x0.20 = 48 tons of gold. It was two and a half times the export from Ghana, Africa (19.2 tons of gold). The Phaistos Disc of Crete (1458 BC) is an important source for this whole story. North America was discovered in the Fourth Dynasty, as shown by the 40th latitude line. At the end of this Dynasty the inter-continental Metal Trade started with the export of four metals: copper, tin, silver, and gold. This Trade across the Ocean begun in the Fifth Dynasty, as shown by the Two Rocks, referring to the complementary latitude line, at 48o + 2o = 90o - 40o = 50oN. The Metal Trade ended at the start of the 20th Dynasty, as shown by the meridian, which hits the coast at the Gulf of Campeche, at 40o/2 = 20oN. The name of the State of Minnesota literally means “Site of Mining”, the name of the capital of Minneapolis means “Town of Mining”. There is a village south of Duluth called Minong, WI. The word of “mine” is called after the legendary King Minos of Crete, who reigned this island for 550 years, from 2000 to 1450 BC. The island had a large fleet of ocean going ships, transporting metals from America. The name of Isle Royale, Lake Superior, is called after this king. The name of “Minos” is derived from the old Egyptian god Min, who was the god of love. The name of Copper Harbor shows there were copper mines on Keweenaw Peninsula and Isle Royale. An ancient name of copper was “anta, or “onta”. The village of Ontonagan, MI, has an ancient name, just like the Canadian province of Ontario, which means “copper river”. Copper ore is often green, as shown by the name of Greenbay, WI, and the city of that name. The name of the nearby city of Appleton, WI, is from Apple Town, or town of the “golden apples” of copper. 1. Mr. Charles Bruns, personal communication. 2. Susan English, Website of the Ancient Waterways Society. 17. De Jonge, R.M., “Tripod Rock, Pyramid Mountain (Morris County, New Jersey, c.1900 BC)” (2011), Refs.5,6, to be published. 19. De Jonge, R.M., “Gold Ring (Grand Canyon, Arizona, c.1450 BC) (2010), Ref.5, to be published. 20. De Jonge, R.M., “Sentinel Rock, Vermont (Discovery of America and Biblical Flood, c.1900 BC)” (2011), Refs.5,6, to be published. 21. De Jonge, R.M., “Oil City Glyphs (Pennsylvania, c. 2000 BC)”, Ref.5, to be published. 22. Peiser, B.J., Palmer, T., Bailey, M.E., Natural Catastrophes during Bronze Age Civilizations, BAR International Series 728, Oxford, 1998 (ISBN 0-86054-916-X). 23. Baillie, M.G.L., “Hints that Cometary Debris played some Role in several Tree-Ring Dated Environmental Downturns in the Bronze Age”, Ref.22, pgs.109-117. 24. Peiser, B.J., “Evidence for a Global Disaster in the Late 3rd Millennium BC”, Ref.22, pgs.117-140. 25. Courty, M.-A., “The Soil Record of an Exceptional Event at 4000 BP in the Middle East”, Ref.22, pgs.93-109. 26. Clube, S.V.M., and Napier, W.M., The Cosmic Serpent, Faber and Faber, London, 1982. 27. Clube, S.V.M., and Napier, W.M., The Cosmic Winter, Blackwell, Oxford, 1990. 28. Joseph, F., Survivors of Atlantis, Their Impact on World Culture, Bear & Co., Vermont, 2004 (ISBN 1-59143-0-040-2). 29. Baillie, M., Exodus to Arthur, Catastrophic Encounters with Comets, BT Batsford Ltd., London, 1999 (ISBN 0-7134-8681-3). 31. De Jonge, R.M., “The Brandenburg Stone, Comet Catastrophe of 536/540 AD” (560 AD, Battletown, Meade County, Kentucky) (2010), Ref.5, to be published. 32. De Jonge, R.M., “About the Brandenburg Stone (560 AD, Battletown, Meade County, Kentucky)”, Ref.5, to be published. 33. De Jonge, R.M., “Ikom and the Dardanus Flood (c.1159 BC, Cross River State, Nigeria)”, Ref.5, to be published. 34. De Jonge, R.M., “Great Serpent Mound (c.2300 BC, Adams County, Ohio)” (2010), Ref.5, to be published. 35. De Jonge, R.M., “Northern Crossing, Biblical and Dardanus Flood, (Reykjavic, Iceland, c.770 BC)”, Ref.5, to be published. 36. Rydholm, C.F., Michigan Copper, The Untold Story, Winter Cabin Books, Marquette, 2006 (ISBN 0-9744679-2-8). 37. De Jonge, R.M., “Copper Trade with the Old World (Poverty Point, NE Louisiana)”, Ref. 5, to be published. 38. De Jonge, R.M., “Petroglyph of a Sailing Boat (Copper Harbor, Upper Michigan, c.1640 BC)”, Ref.5, to be published. 39. De Jonge, R.M., “Minoan Pendant (Cleveland, Ohio, c.1690 BC)”, Ref.5, to be published. 41. De Jonge, R.M., “The Bronze Doors of Rekhmire (Thebes, Upper Egypt, Eighteenth Dynasty, c.1460 BC)”, Ref.5, to be published. 42. De Jonge, R.M., “The Myths of Monks Mound (Cahokia, Illinois, 650-1400 AD)”, Ref.5, to be published. “Peters Creek Mound (c.715 BC, Clairton, Pennsylvania)”, Ref.5, to be published. 45. De Jonge, R.M., “Four Ancient Stories (Poverty Point, NE Louisiana, c.700 BC)”, Ref.5, to be published. 46. De Jonge, R.M., “Megaliths of Arrowhead Region I (Minnesota, c.1900 BC)”, Ref.5, to be published. 47. De Jonge, R.M., “Megaliths of Arrowhead Region II (Minnesota, c.1900 and c.770 BC BC)”, Ref.5, to be published. 48. Bailey, J., Sailing to Paradise, Simon & Schuster, 1994 (ISBN 0-684-81297-5).